This book examines and evaluates the strategies utilized to design and synthesize pharmaceutically active agents. Significant updates over the last 10 years since the publication of the 1st edition include synthesis of enantiomerically pure isomers, novel chemical methodologies, and new pharmaceutical agents targeted at novel biological endpoints. 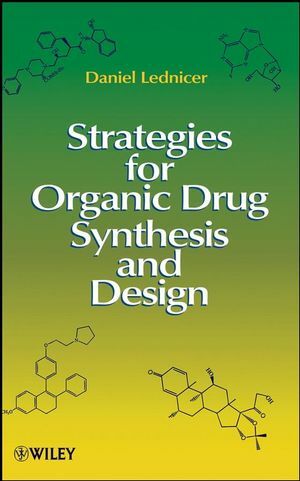 Written by an experienced successful author, this book meets the needs of a growing community of researchers in pharmaceutical R &D, as well as medical professionals, by providing a useful guide for designing and synthesizing pharmaceutical agents. Additionally, it is a useful text for medicinal chemistry students. Daniel Lednicer, PhD, is the acclaimed author of several books on drug synthesis and discovery. His career has been devoted to the search for new therapeutic agents. Dr. Lednicer spent two decades at the bench as a chemist at the Upjohn Company. He has also served as director of chemical research at Mead Johnson, director of pharmaceutical sciences at Adria Laboratories, and pharmaceutical manager at Analytical Biochemistry Laboratories. Most recently, he was a project officer at the National Cancer Institute. 1. PROSTAGLANDINS, PEPTIDOMIMETIC COMPOUNDS, AND RETINOIDS. 2.4 Arylacetic and Arylpropionic Acids. 4.4 Gonanes, the 19-nor Steroids. 5. STEROIDS; PART 2: COMPOUNDS RELATED TO PROGESTERONE, CORTISONE, AND CHOLESTEROL. 5.4 Compounds Derived from Cholesterol. 7.2 Drugs Derived from Morphine. 7.3 Compounds Prepared from Thebaine. 7.6 Analgesics Based on Nonfused Piperidines. 8.2 Rings that Contain One Heteroatom. 8.3 Rings that Contain Two Heteroatoms. 8.4 Rings that Contains Three or More Heteroatoms. 9. DRUGS BASED ON SIX-MEMBERED HETEROCYCLES. 9.1 Rings that Contain One Heteroatom. 9.2 Rings that Contain Two Heteroatoms. 9.3 Rings Containing Three Heteroatoms: The Triazines. 10. FIVE-MEMBERED HETEROCYCLES FUSED TO A BENZENE RING. 10.1 Compounds that Contain One Heteroatom. 10.2 Compounds that Contain Two Heteroatoms. 10.3 Compounds that Contain Three Heteroatoms. 11.1 Compounds that Contain One Heteroatom. 11.2 Compounds that Contain Two Heteroatoms. 11.3 Compounds that Contain Three Heteroatoms. 12. SEVEN-MEMBERED HETEROCYCLIC FUSED TO BENZENE. 12.1 Compounds with a Single Heterocyclic Atom. 12.2 Compounds with Two Heteroatoms. 13.1 Compounds Containing a Single Heteroatom. 13.2 Compounds Containing Two Heteroatoms. 13.3 Pyridine-Based Fused Tricyclic Compounds. 15. HETEROCYCLES FUSED TO OTHER HETEROCYCLIC RINGS. 15.1 Two Fused Five-Membered Rings. 15.2 Five-Membered Heterocycles Fused to Six-Membered Rings. 15.3 Two Fused Six-Membered Rings. 15.5 Heterocyclic Compounds with Three or More Rings. Cross Index of Biological Activities. ?In this book, Lednicer presents a detailed discussion of strategies toward the synthesis of pharmaceutical compounds. . . The strength of the book is the wealth of data collected in one relatively short tone?.